The SMX2060 and SMX2064 are the only 7-1/2 digit DMMs available in PXI format. The SMX2060 provides a comprehensive set of DMM functions, is much faster than any bench-top DMM, and maintains high accuracy even at the fastest measurement rates. 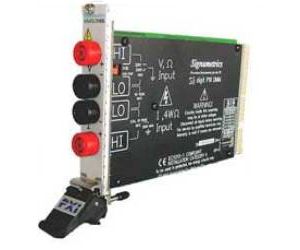 The SMX2060 digital multimeter is a PXI card that slides directly into any 3U-slot in your PXI chassis. Signal leads go straight from the SMX2060 in your PC to the device under test or to a switching card. There is no need for intermediary devices between the DMM and your computer. This eliminates the need for IEEE488 or other controller languages. By cutting down on the number of components in your test system, the PC plug-in design provides automated measurement capabilities, cost effectively, with no compromise in performance.